After the enormous success of Blonde on Blonde, Bob Dylan had his motorcycle accident and he retreated from the public eye. He wouldn’t put on a public concert for a few more years, and it would be about eight years before he toured again. After exploring rootsier music in private with The Band in recording The Basement Tapes demos, he made something of a break with the studio recordings of John Wesley Harding. In what would come to characterize a lot of Dylan’s later recordings, there is something of a search for peace and solitude in this music, as opposed to the brash and bold approaches of Highway 61 Revisited and Blonde on Blonde. He turned away from what listeners might have expected. Now Dylan was exploring myth and historical curiosities of the American Old West — just after the Summer of Love found the counterculture exploring entirely new social relations. 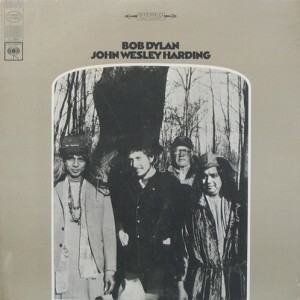 The album title is about Texas gunfighter John Wesley Hardin (Dylan changed the spelling here). The entire album is something of a return to more traditional folk music, but with a significant change from Dylan’s earliest albums. This album was recorded with a backing band, and the drums of Kenny Buttrey and bass of Charlie McCoy propel the music forward. If any of Dylan’s albums deserve the description “folk-rock” he so disliked, it’s probably this one. Recorded entirely in Nashville, Dylan’s vocals are noticeably stronger than on so many of his recordings. His nasal whine and mumbled grunts are held in check. The songs tend to be good, even if some are content to merely lock into a simple groove. “All Along the Watchtower” is a song usurped by Jimi Hendrix for an incendiary cover version on next year’s Electric Ladyland. Although the version by Hendrix is iconic, Dylan’s original version is still vital. Dylan’s version has a pressing weariness that is completely different from the ominous desperation of the electrified Hendrix version (which tends to be used in almost every Hollywood Vietnam War movie). While perhaps not as immediately ear-catching to the newcomer as the last few albums, John Wesley Harding remains among Dylan’s best albums. I’ve played this album numerous times around others and they ask what it is, because few seem to immediately recognize this as Dylan (or at least seem unsure about it) but generally are drawn to like it.